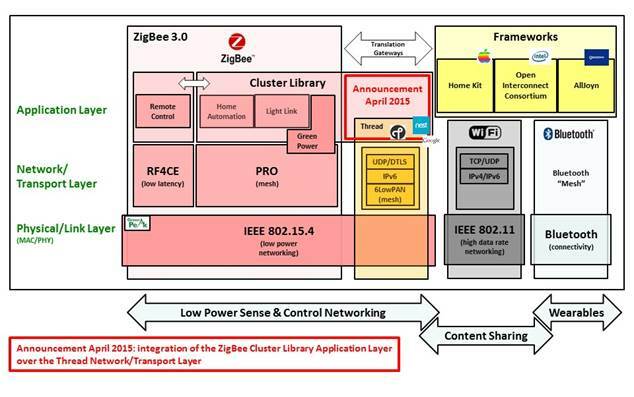 GreenPeak applauds the direction taken by the ZigBee Alliance and the Thread Alliance for planning to integrate the ZigBee Cluster Library on top of the Thread networking stack. This step is a move into providing the ZigBee Alliance with a clear IP-strategy, and the Thread Group with a standard for Application profiles. However, it is clear that a lot of work needs to be done to get this all in place, including proper test specifications and certification procedures. Setting out a clear direction for the industry will make life easier for both product and technology providers. Challenges thet need solving remain, including coexistence/migration of the ZigBee PRO networking layer and the Thread networking layer, integration of ultra-low power end devices (ZigBee Green Power) in a Thread environment and bridging of ultra-low latency RF4CE ZRC2.0 capabilities across ZigBee/Thread networks. In principle all the key components are available to build an efficient IoT local area networking environment, but to make this secure, power efficient, easy to use (self-install) and cost effective at the same time will be a challenge. GreenPeak has a rich history in WiFi standardisation, and if there is one (obvious) lesson learned, it is that in communication technology standards working together is essential. Currently, there are many initiatives in the industry to standardise different elements of IoT communication protocols, but this announcement positions two credible IoT standardisation bodies to provide direction for the first end-to-end protocol, including IEEE 802.15.4 (for the physical layer), IETF 6LoWPAN (for the networking layer) and the ZigBee Cluster Library (for the application layer). On first glance, this may appear to be a small step, but in the near future this step could become a key milestone in the development of the IoT and the Smart Home.